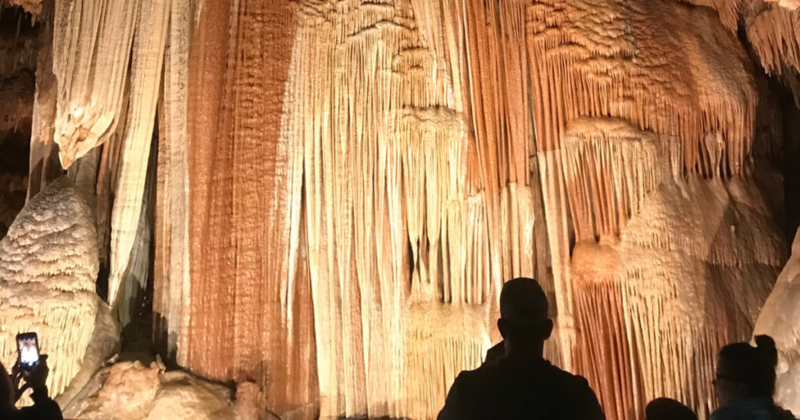 Follow along with our touristy team member, Lauren, who took a recent day trip to Meramec Caverns and went exploring! After a long, snowy winter, the sun finally decided to come out to play making for a beautiful spring day in the Lou. The temperature climbed up to a mild 60°, perfect for exploring outdoors…or so it seemed. With strong winds in the forecast, we searched for the perfect weekend adventure that would sweep us off our feet (although not literally)! Our day began with a quick drive through Lone Elk Park in Valley Park, MO. Upon entering the park, we saw several elk and bison enjoying the sunshine and sauntering in the fields. 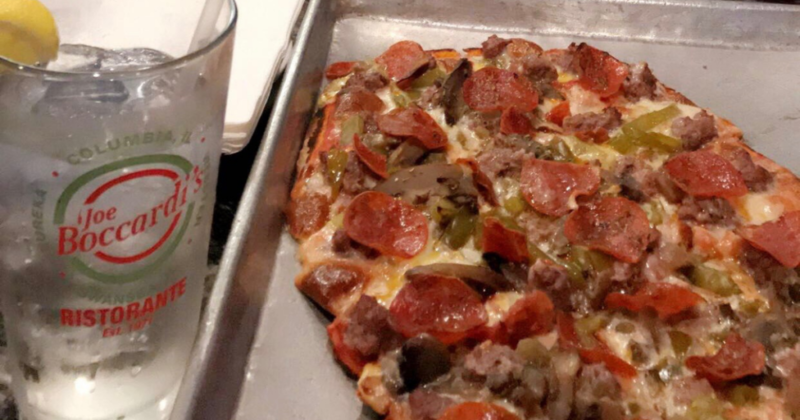 After a lap around the park, we hopped back on the highway en route to Meramec Caverns, but soon made a tasty pit stop at Joe Boccardi’s in downtown Eureka for lunch. Following the road signs down winding country paths, we at last reached our destination. With the river flowing to our left, ziplines towering up above us, and signs for boat rides approaching, we only wished it had been warm enough to get the full experience! Take $10 OFF your admission at the Meramec Caverns’ Caveman Zipline! My day trip to Meramec Caverns went above and beyond my expectations. Meramec Caverns is certainly a “buried treasure” tucked away in Stanton, MO. With several rooms to explore, the hour long cave tour kept us engaged and curious. Between the history of Jesse James, the hint of Hollywood fame, and the patriotic light show at the conclusion of the tour, there is something for everyone. Our tour began in the Ballroom, where a silver disco ball glistened as it hung unexpectedly from the ceiling. The nickname the ‘Ballroom’ comes from its usage in the late 1800’s as a place for locals to beat the heat and come together for cave parties. The room remains in use today for special events, including an annual gospel concert and educational classes for school-aged kids. 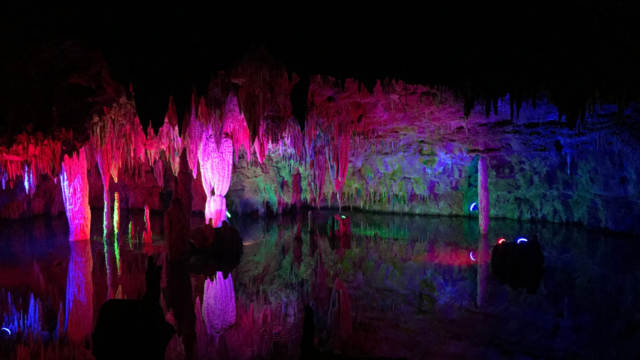 Boasting incredible stalagmites and stalactites that date back to hundreds and thousands of years ago, the caverns hold stories of the past that deserve to not be forgotten. 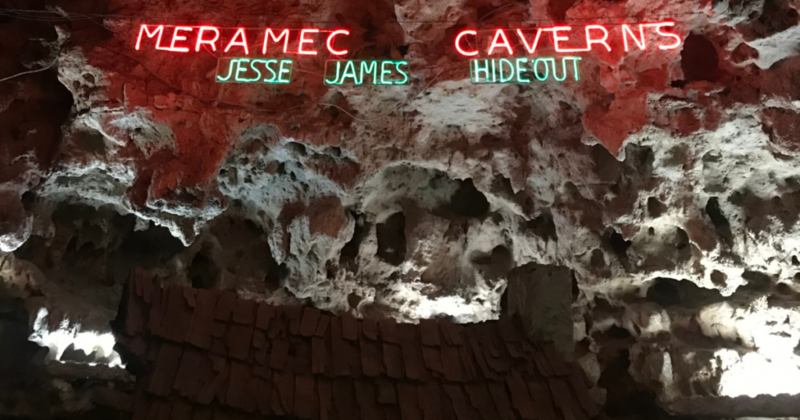 Nicknamed the ‘Jesse James Hideout,’ the caverns served as an escape route for the infamous Civil War outlaw, Jesse James. Artifacts from one of his train robberies over a century ago remain preserved in the cave and on display for guests to view. Another memorable room was named ‘Hollywood’ for the two episodes of Lassie filmed there, as well as the 1973 film version of Tom Sawyer. The magic of Hollywood contributed to the mystery of the Caverns and helped put this small town on the map. 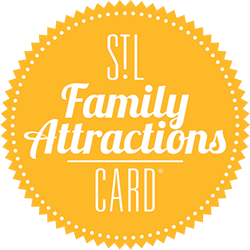 Between the Earth’s natural beauty found in the world’s rarest cave formation, The Wine Table, and the history left behind from the 19th century, Meramec Caverns offers families a trip back in time! Keep exploring and save on your next day trip to Meramec Caverns!